For thousands of years, people have traveled to sacred places, sometimes to worship, sometimes to seek healing or favors, sometimes to find something within themselves. Often the pilgrimage itself became more meaningful and offered greater lessons than what was gained once one reached the holy site. Most of us are familiar with the pilgrimages of the Crusades era, Paul Bunyan’s epic “Pilgrim’s Progress,” the pilgrimage stories of Chaucer’s “Canterbury Tales,” and the pilgrimage of The Way of El Camino de Santiago, the pilgrimage that crosses more than 500 miles of Spain. The scallop shell, symbol of St. James, patron saint of pilgrims and of the El Camino de Santiago in particular, has become so ingrained in our minds about travel that a well-known oil company has used it for years as its logo for gasoline for travel. But the scallop shell has a much older meaning than the Christian symbol. “Rafael Lema in his wonderful book El Camino Secreto de Santiago,claims a much earlier origin. And it is very convincing. In Moraime on the Costa do Morte there was once a Benedictine monastery. Archaeological investigations have also found, on this site, remains of a Visigothic settlement, and a Roman necropolis. Amongst other things, two bronze scallop shells were discovered, dating from early Roman occupation of the Peninsula. They are evidence of the worship of Venus. This symbol, claims Lema, was converted into one of the Camino de Santiago, but its origins are clearly maritime, and pagan. Along with the Venus Cult, the Romans, especially those from North Africa brought the Cult of Isis. Both are considered goddesses of love. The cathedral itself is built over a pagan site dedicated to Jupiter and I myself have seen, in a tiny church near Padron, a large stone marker on which the name of Mercury is inscribed. I have promised never to reveal where as the lady with the key didn’t even know its significance but said that it must never go a museum. I agree. 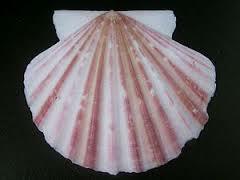 The lines and grooves on the scallop shell are said to represent the meeting of all the roads to Santiago in Compostela; it is a nice image. However, the shell is also claimed to represent the setting sun; the rays off the horizon at the ends of the earth.” from Pilgrimage To Heresy Blog. Maybe now that you are retired, you might consider taking groups to sacred places. After the new studio is built and the boat stops rocking, it will be time for me to travel again. Hi Monda, you’re right – spiritual travel with groups is on the agenda. I leave for my own pilgrimage to “Avalon” today. Stay tuned for lots of new offerings in June – a retreat, more workshops and classes! Nice to hear from you!